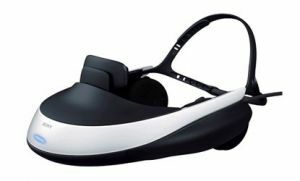 Sony revealed that the HMZ-T1 OLED HMD will arrive in the US in November 2011 - for around $799. The HMZ-T1 is a head mounted display featuring dual 1280x720 0.7" OLED microdisplays - offering the same experience as watching a 750" display from 20 meters. The unit comes with an external processor box offering HDMI intput and output (you cannot use the HMD without the processor box).